Combining classical Greek and Roman architecture, Beaux Arts was the favored style for grandiose and massive public buildings and large houses for the very rich from 1885 to 1925. The style, which was most popular between 1890 to 1920, is associated with the Gilded Age when wealthy industrialists adopted the opulent fashion for their elaborate private homes. The firm of McKim, Mead & White is particularly known for designing lavish homes based on Beaux Arts ideas. The Beaux Arts (French for "fine arts") style originated at the Ecole des Beaux Arts, a famous architecture school in Paris. Many American architects studied the principles of classical design at the school and brought them to the United States. These architects, who were the first formally trained architects in the nation's history, wanted to adapt European architecture to modern American uses, needs, and technology. Also known as Classical Revival, or Academic Classicism, the Beaux Arts style combines classical architecture from ancient Greece and Rome with Renaissance ideas. It is characterized by a strong sense of order, symmetry, formality, grandiosity, and ornamentation. Due to the massive size of Beaux Arts buildings, the style was most commonly used for civic buildings such as libraries, banks, museums, courthouses, universities, city halls, and railway stations. Famous Beaux Arts structures include the New York Public Library, Carnegie Hall, and the Palace of Fine Arts in San Francisco. Central Los Angeles has the largest collection of Beaux Arts architecture in the country outside of New York City and Chicago. The great event for proponents of this style was the World's Columbian Exposition in Chicago in 1893 (known as the Great White City ) that featured Beaux Arts buildings. The buildings and streets laid out at the Exposition, free of filth and poverty, represented an ideal of urban beauty that struck a chord with the general public as well as with the architectural community. The Exposition became the impetus for the short-lived City Beautiful movement. After the Exposition, the Beaux Arts style led to planned communities with large, showy houses, wide boulevards, and vast parks. A number of Fullerton residents attended the influential 1893 Exposition, where Fullerton 's walnut and citrus crops were displayed, and influential residents did try to implement City Beautiful plans during the town's early development. Hillcrest Park with its "Plan Beautiful" was an attempt to adapt this philosophy in Fullerton. 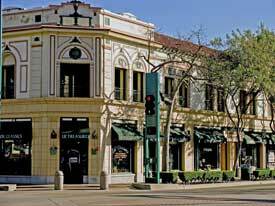 Fullerton has only one remaining Beaux Arts building: the Farmers' and Merchants' Bank (1904, redesigned in 1922), now called the Landmark Plaza Building, at 122 N. Harbor Boulevard. In 1922, local architect Frank Benchley added shields, recessed panels, faux stone, molded trim, and classical floral motifs to the building, turning it into an elaborate example of a Beaux Arts building. By 1925, the Beaux Arts style had fallen out of favor, criticized as being too ostentatious. Later in the 20 th century, however, postmodernists rediscovered an appreciation of the Beaux Arts ideals and began to incorporate them into their designs. Drexler, Arthur, ed. The Architecture of the Ecole des Beaux-Arts. Cambridge: MIT Press, 1977. Muccigrosso, Robert. Celebrating the New World: Chicago 's Columbian Exposition of 1893. Chicago: I.R. Dee, 1993. Platt, Frederick. America's Gilded Age: Its Architecture and Decoration. South Brunswick: A.S. Barnes, 1976. White, Samuel D. The Houses of McKim, Mead & White. New York: Rizzoli, 1998. White, Samuel D. McKim, Mead & White: The Masterworks. New York: Rizzoli, 2003.